Arsenal drew 1-1 with Atletico Madrid in the first leg of their Europa League semi-final this evening and everyone’s convinced the tie is already over. The Gunners will now travel to Madrid next week in need of an away goal if they are to have any hope of making it into this season’s final…unfortunately for them Atletico haven’t conceded a goal at home since the 20th of January. Alexandre Lacazette’s header gave Arsenal a 1-0 lead this evening as the team looked to be set to give Arsene Wenger the perfect final home game in charge of the club in European competition. 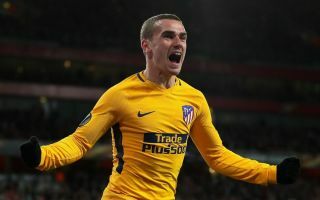 Antoine Griezmann, however, pounced on some catastrophic defending from Laurent Koscielny to make it 1-1 late on and hand the advantage to Diego Simeone’s side. Well, for most of this game you’d have to say Arsenal were, in fact, very good. They dominated possession and chances and looked genuinely fired up to deliver a good result for their departing manager. Up until Griezmann’s equaliser, Atletico had only had 18% possession and zero shots, which gives you some idea of how much the Gunners looked to be in control. On top of that, Lacazette’s recent scoring streak has to go down as a real boost for the club as it dispels the myth that had been growing that he would go down as a flop signing. The France international was a prolific scorer at Lyon and though he was slow to settle in England, he now has seven goals in his last seven games. This gives Arsenal real hope for next season, and of course it could still mean they have hope in next week’s second leg as long as they give him the right service. The defending from Koscielny was absolutely shocking, as one of Arsenal’s most experienced players on the pitch for some reason dealt with a fairly harmless long ball by trying to kick it over his head while Griezmann was lurking. Instead, he pretty much hit it against his own face, allowing the Atletico front-man to nip in and grab what looks to be a crucial away goal. In many ways, Arsenal going out of the Europa League because of Koscielny kicking the ball into his own face would be a more fitting send-off for Wenger than them winning it. Given that Arsenal were up against ten men and totally dominant, this one moment of madness is a huge let-down and leaves them with it all to do in the Spanish capital next time. Game over Arsenal. A bad week for teams in red this week ? Game over. Almost guaranteed @Arsenal will not make the final now. Disastrous result playing against 10 men for 80 minutes. Poor stuff.